Forthcoming shows in Egypt, East Africa and Central Asia will reflect the business potential of the coatings sector in key emerging markets. The events are being organised by dmg events and take place in Cairo, Nairobi and Almaty. The Cairo show, scheduled for October 7 to 8 of this year, is a relaunch of dmg events’ Egypt Middle East Coatings Show. The new shows of the company are the East African Coatings Congress in Kenya and the Central Asian Coatings Show in Kazakhstan. Growing regional populations around each of the venue states have fueled demand for affordable housing and other infrastructure, boding well for the coatings industry’s growth. The East African Coatings Congress will be held from June 8 to 9, 2016 at the Safari Park Hotel in Nairobi, Kenya. 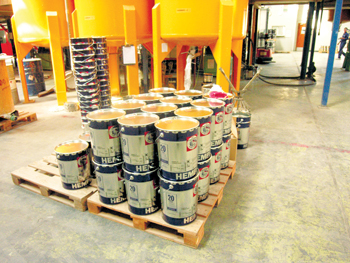 The host country is the region’s largest paint manufacturer, from where almost all chemical raw materials are imported. The two-day conference and exhibition will provide an ideal opportunity for suppliers to present their products and services to business owners and decision makers within the market. The Central Asian Coatings Show will be hosted from November 9 to 10, 2016 at Almaty Tower in Almaty, Kazakhstan. Accounting for 45 per cent of the regional coatings market, Kazakhstan is Central Asia’s biggest paint consumer. The country is therefore the perfect venue for the show as it continues to generate more demand driven by infrastructure improvements, a developing automotive manufacturing industry, and expansion of the capital Astana. The relaunched Middle East Coatings Show in Egypt will leverage the country’s paint market valued at $515 million, the second largest in the Middle East (Frost & Sullivan). A biennial event, the show will be held from October 7 to 8, 2015 at the Cairo International Convention and Exhibition Centre, complementing the current domestic economic growth of 4 per cent with an estimated 9 per cent driven by the paint industry. Several infrastructure projects just completed or under construction, including the new Suez Canal expansion and the ‘New Cairo’ – a 30,000-hectare upcoming city spread on the southeastern edge of present Cairo, have placed Egypt’s paint industry on a growth trajectory. “By extending our brand in Egypt with the re-launch of the Middle East Coatings Show, we aim to ensure our leadership in the growing market by establishing our stronghold in the region. It will allow us not only to cater to the demands of the expanding Egyptian economy but also of the region that includes Syria and Libya with their possible economic recovery. We are upbeat that our new shows will offer critical insights into the coatings industry and at the same time extend our portfolio to cover the Middle East, Africa and East and South Asia,” concluded Faux.